Taco corn chowder with cheese is a simple and delicious one-pot weeknight dinner. It’s perfect for a cool Fall night, and it’s a great Thermos lunch! A version of this taco corn chowder recipe has been up here forever…it started out as corn and cheese chowder, which I barely adapted from the Pioneer Woman’s original recipe. I remember thinking the first time that I made it, though, that it would be delicious with some taco meat stirred into it. Because, I mean, what savory foods are not improved by having a bit of seasoned ground beef added? Tacos are a bit of an obsession for me. Not trendy street tacos, though, as much as I love them. No no…ground beef tacos with regular old seasoning (albeit homemade) in crunchy corn shells. I also hadn’t really figured out that it’s okay to riff on someone else’s recipe, but really, if you aren’t doing something to really make it your own, why would people read your website to get the recipe instead of getting it from the original source? Funny thing, though…I talked about it here like “oh yeah, here’s how I made it, but go to Pioneer Woman’s website to get the detailed recipe”. I was still a novice, less than a year into the blog back then. This taco corn chowder is the kind of thing that we eat on weeknights. I blog about the way that I cook: from scratch but simple. I have never been a “meat and three” type of person…too many things going on makes my head spin. One-pot meals, casseroles, soups…that’s the way we eat. We had enough of this soup to eat it for two nights and I was able to put it in my Thermos for lunch one day too. You could definitely eat taco corn chowder with some bread or crackers or a grilled cheese, but personally I like tortilla chips with it. I went for Nacho Doritos, one of my weaknesses. I can’t keep them in the house, because I eat them incessantly. We split a small bag, and it was a good idea. 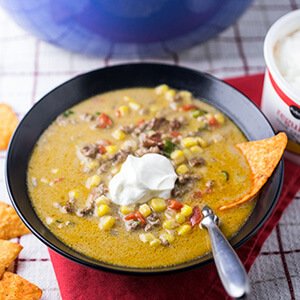 Taco corn chowder is easy and filling and perfect for a weeknight dinner! Preheat a 6-8 quart Dutch oven over medium heat. Cook the bacon until almost crisp. Add the onions, red pepper, and jalapeño pepper and cook until softened. Add the ground beef and cook until browned. Add the chili powder, cornstarch, onion powder, garlic powder, salt, paprika, cayenne, and cumin and stir until just combined. Sprinkle the flour over the ground beef. Cook and stir for one minute. Add in the corn, the chicken stock, and the half and half. Stir until well-combined. Cover the soup and cook for 15 minutes. Stir in the cheese a handful at a time. Salt and pepper to taste then stir in the the green onions right before removing from the heat. Serve immediately, topped with sour cream if desired. I am always looking for new ideas and this looks and sounds delicious!! 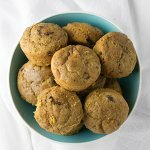 I also blog about food "rezichfamilykitchen" and look everywhere for inspiration on what to make each week. This is definitely going on our menu for next week!! Thanks for sharing! Thanks for reading. It really was tasty!